From Ping: In the ZING2 iron, Karsten engineers created a higher moment of inertia, which produces greater resistance to twisting on off-center hits... the extreme perimeter weighting of the ZING2 increases the clubs' effective hitting area, optimizing forgiveness and accuracy. They feature a "leaner" more subtle profile (more standard width top line etc...) than their original "ZING" predecessors. Bought my Zing 2 set in 1995 and swore I’d never get rid of them. Fantastic feel when you hit them solid. Very forgiving. Great distance. Immediately was a club longer than my previous set. I couldn’t think of a negative with this set! These are solid beginner clubs. I received my grandpa's set (along with his Eye2+no+) and prefer the zing 2's to the Eye2 (I know, blasphemy!) I had them refinished and bent to yellow. They are very forgiving and solid clubs and I always get compliments when I go golfing (2-3 times a year). Seriously, do yourself a favor, get a solid set of 4-SW off ebay for less than $150. Spend approximately $100-$150 regripping and cutting the shafts to your preference and bend the heads to your preferred angle. Even with refinishing the heads you'll end up with like new semi-custom fit irons for less than $300. I called Ping to ensure there wouldn't be an issue having a local fitter bend them from black to yellow and they were friendly and helpful. They even let me know where they were manufactured and when. Eye2, G20, multiple other g series irons all ping. Ping zing 2 to me best irons out there,tried several other irons and always back to my ping zing 2,been on the range with my son's ping g10 and I see no real difference in height or distance to talk about and did not like the very wide sole on the ping 10 irons,I was at the range and course with taylormade rocketbladez,yes they did out distance the zings,by at least a club length,but not as forgiving,accurate or consistent as the zings.we all like a new set of irons and I've tried several,but to spend the money on a new set that does nothing other then a few yards more then your old set,or keeping up with your friends (who's score card are always in the 70's) with there new cigars and new clubs,we all have them friends,again I will keep my zings,and keep my buddies on their toes. Used ping service once,on a ping g2 iron,the black rubber weight feel out,they fixed it no charge. Ping g2 g10. And taylormade rocketbladez,got as a gift,put still used my zings. Bought these as my 2nd set of irons in my life. Had a cheap $100 set 1st. I've now had them since 1995 and I won't even consider getting rid of my irons! These are the easiest irons to hit.....period. Swing away and feel confident the ball will sail high and land soft. I've played a bunch of newer irons from other brands and nothing has been as good as these. The oddly shaped soul is perfect for picking the ball off the grass. They don't dig or get stuck. The finish is perfect for taking a beating. These irons have made golf much more fun and relaxing. I had a set of Zing2's several years ago and really enjoyed them. Tried several things since then and never really saw any difference other than length on the newer, stronger-lofted irons. Found a set recently and bought them. they are still one of the best sets of irons I have ever used. They set up nicely, very forgiving yet accurate. The JZ steel shafts are an excellent shaft. Just for grins, I tried both the Burner 2.0 and AP1 712 irons recently, and returned both sets. Still like the look, forgiveness, and consistency of the Zing2's better than anything else out there. Many, many sets over the years. Zing2's are probably the best overall irons Ping ever made. Picked up a set with JZ stiff shaft for $158 .00. These irons are very stable at impact. Very straight ball flight . Very good launch from all types of lies which was most impressive feature.. PW is 47 degrees so you need to either bend or make sure to alter your other wedges. I found that these clubs are a 1/2 club shorter than newer products due to weaker lofts but you cant beat these for performance. Appearance is not a players blade but actually sets up nicely. I was even able to work the 9 iron around a tree when needed. Have lofts and lies checked before putting in bag. Shaft plays medium stiff. I started playing golf later in life and never played very well. I was looking at clubs in a golf shop twenty years and spoke with the salesman about my problems. He had a used set of Ping Zing 2 irons with graphite shafts he had taken in trade. He highly recommended them so I bought the clubs. I'm still playing with the same set of clubs today and purchased a second set on e-bay when I retired. These irons are easy to hit and always fly straight down the middle. I now address the ball with a great deal of confidence knowing my Ping Zing 2's will do the job. I would highly recommend these clubs to anyone looking for a steady, reliable set of irons they can always depend on. You can still find them on e-bay and they're well worth the search. 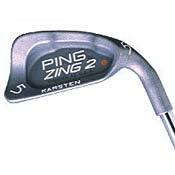 I started out with a set of Ram irons and woods which I played until trading them in for my Ping Zing 2's. Have been wanting a set of Ping Zing 2s since I was young. Found a set on Craigslist 2I-SW for only $175 with new Winn grips! I love the confidence I get from these clubs. Very Accurate! Great set! I'm trying to keep my 15 year old son from taking these away from me.